It can be hard to describe exactly what you are feeling when you experience either vertigo or dizziness. Some people may even use both words to describe the same sensation. However, it is important to note that vertigo is much different than dizziness. Vertigo is a vestibular disorder, meaning it comes from the inner ear and is related to a malfunction of the vestibular system. As many as 40 percent of people over the age of 40 years have had some type of vestibular disorder such as vertigo. Vertigo is not a condition, but rather a symptom or a description of a sensation. You may actually experience both vertigo and dizziness at different times. Vertigo can be quite disabling when it occurs, especially if nausea and vomiting accompany it. It is usually not a serious condition unless you are performing a task when you experience a vertigo attach, such as driving, operating heavy machinery, or flying an airplane. Visiting a primary care doctor for dizziness accounts for about 6 percent of all doctor visits. The inner ear is made up of the semicircular canals, saccule, and utricle that help the body to detect body motion and position. The signals from these structures travel to the brain via the vestibulocochlear nerve or the 8th cranial nerve which is also involved in hearing. The information is then processed in the brainstem that then adjusts your posture and coordinates movement in conjunction with the cerebellum. This then provides you with balance so you do not fall over. If a disorder happens within any of these structures, vertigo ensues. Very few cases of dizziness or vertigo indicate a serious underlying problem. There are basically two types of dizziness: those with and those without vertigo. There is some overlapping, but generally, this is the rule. *Vestibular migraine is becoming more and more recognized as a cause of dizziness with vertigo. This migraine is most often seen in those with a family history of migraines. The head pain is usually accompanied by vertigo or dizziness. If it is a medication causing your dizziness or vertigo, your doctor will probably recommend stopping the medication and trying a similar one. 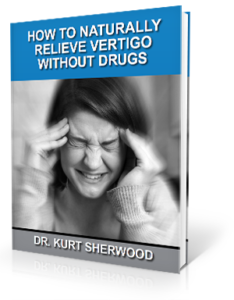 Most ways to care for vertigo have to do with caring for the symptoms rather than trying to find the underlying cause. For example, meclizine or promethazine can help with nausea and vomiting, diazepam or lorazepam can help with inner ear disorders, and antihistamine drugs are used as an alternative. It has been seen that certain vestibular disorders, including vertigo, often occur after some type of trauma to the head or neck. Something mild such as a fender bender or a trip and fall can be enough to cause issues. This is because the top bone of the neck, the C1 or atlas, is very susceptible to misaligning due to its shape and mobility. The atlas was designed to protect the delicate brainstem. Therefore, a misalignment here can put stress on the brainstem and cause it to malfunction. This causes it to send improper signals to the brain. If the brain receives one signal from the brainstem and different signals from the eyes, ears, and nerves about the body’s location, the end result can be vertigo. By correcting the misalignment and restoring proper communication between the brain and body, vertigo may improve or go away completely. This has been proven in case studies. Here at Sherwood Spinal Care in Renton, Washington, we use a method that gently realigns the bones without the need to crack or pop the back or neck. This is a more natural process that allows for a longer-lasting adjustment, leading to fewer visits to our office later on.